#Otherworldly Words explores words that deal with the frightening or supernatural. This month I’m exploring words that express cowardice. 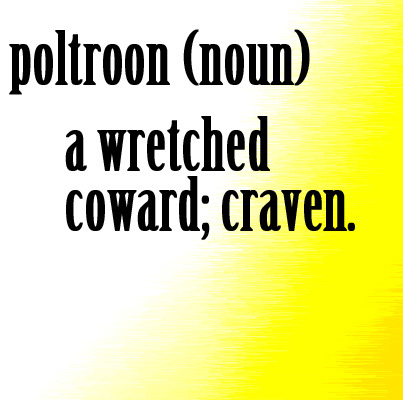 Poltroon derives from Old Italian meaning foal and Latin meaning young animal. This is similar to calling someone a “scaredy cat” to liken them to a young horse that startles easily. It’s important to note that the definition implies poor moral character “wretched.” (Other definitions state “an abject or contemptible coward.” Words like this one not only expand our vocabulary but shed light on our collective thoughts on cowardice and how negatively it is viewed.